Gymnasiums are designed to host gym class and sporting events, but often serve a dual role as a multi-purpose venue for hosting a variety of other events. The perimeter surfaces in the gym are built to be hard and reflective for sporting purposes, but can also compromise the sound quality in the space due to the excessive echoes that result. As sound waves spread throughout the room, the hard surfaces reflect the echoes back, producing blurred sound signals and elevated levels of background noise. This will compromise the intended use of the gym space. To reduce gym noise, acoustic panels can be wall or ceiling mounted in the room to capture and convert the echoes out of the space. As a result, background noise levels collapse, resulting in greater clarity to vocal instruction, lower levels of crowd noise, and speaker systems that sound crisp and not blurred. Got a loud gym? Get sound panels and convert the echoes out of the room. Questions on Gym Soundproofing? Call 1-800-638-9355. Gym soundproofing is our specialty. Of all the vertical market solutions we provide for premium sound quality, gym sound panel applications represent our signature treatment. The goal is to place a set of sound panels inside your gym, wall or ceiling mounted, to collectively capture and convert the unwanted echoes from your space. Our acoustic sound panels will lower levels of ambient background noise, raising greater clarity to original sound. Lower crowd noise results, with a healthier teaching/coaching environment and greater ease in communication. A more user friendly gym. The key to your success is to confirm the appropriate amount of panel coverage based on room size. Call our help desk at 1-800-638-9355 or submit a Room Analysis form for a free quote back. The most popular sound panel option designed for gym noise reduction is our acoustic VET Baffle. These are colorful sound baffles that hang vertically between the joists in an open deck gym space. They will combine to produce an absorption coefficient in the gym that will capture and convert the unwanted echoes from the space, cleaning the room acoustically, and delivering back the sound values you are seeking. VET Baffles free hang from your ceiling in rows and columns, spread out across the expanse of the room. The key to your sound values is to ensure you have introduced the right amount of sound baffles into the space, which is what our Room Analysis will define for you. If the ceiling height in your gym is under 20 feet, or if you have a finished ceiling in your gym with recess or flush mounted lighting, this will negate your ability to install the acoustic VET Baffles. Instead, the alternative treatment is to line the upper third of your perimeter walls with a set of cloth wrapped sound panels called Fabric Panels. These are colorful, durable sound panels that generate the same level of absorption as the VET Baffles, but will elevate your price points. Call our help desk at 1-800-638-9355 for a cost comparison. VET Baffles are class A fire rated sound panels. 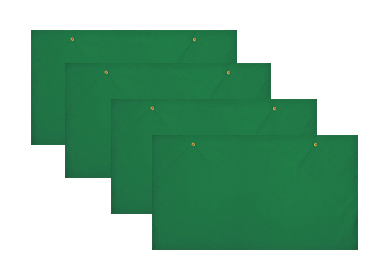 They are waterproof, lightweight, easy to self-install, and come in 25 colors. This treatment is the most popular product for a sound proof gymnasium, which we have sold for more than 25 years. Coming in under $3 per square foot, it is also one of the most cost effective treatments out there. Our clients love them, and so will you. A variety of recent NetWell sound panel projects are featured in our Case Studies Library. We invite you to spend some time there and discover the variety of types of soundproofing projects that our clients have enjoyed. The visuals and testimonials will help move our conversation forward with you on your quest to resolve your gym noise! How Do You Design a New Gymnasium for Premium Sound Quality? Gymnasiums are built with durability and safety in mind and typically incorporate hard, reflective surfaces. 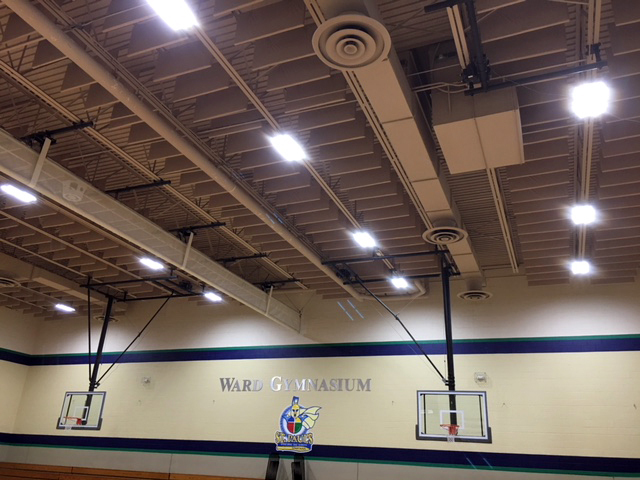 Soundproofing a gymnasium comes after the fact, since sound panels need to be anchored to perimeter wall surfaces or acoustic gym baffles suspended vertically from the ceiling. Retrofitting a gym sound panel treatment is a simple process. The key to successful noise reduction lies in getting the sound panel coverage amounts correct based on the size of your room. Why Are Gymnasiums So Loud and What Can I Do About It? Due to the hard, reflective surfaces that comprise the makeup of every gym, it’s easy for echoes to bounce around the space and to accumulate unwanted levels of background noise. To properly soundproof a gym, sound panels can be mounted on the wall or ceiling to effectively capture these echoes, lower the background noise, and generate greater sound clarity. As a result, gym soundproofing produces lower crowd noise, greater speech clarity, a more favorable teaching environment, and a multi-purpose space. How Do You Soundproof an Existing Gym Space? Soundproofing is all about using acoustic panels to capture and convert the unwanted echoes within the space. In turn, the background noise subsides as original sound clarity is restored. A soundproofed gym has lower levels of crowd noise which makes your space more compatible for teaching, coaching and hosting public events. How Does Gym Noise Adversely Affect Coaching and Teaching? The hard, reflective surfaces in every gym reflect unwanted levels of noise. As the background noise builds, speech clarity becomes compromised. Communication is blurred by the echoes in the room, producing a poor sound environment for effective teaching and coaching. By soundproofing the space, original sound clarity can be restored, especially in regards to vocal instruction by teachers or coaches. How Can Soundproofing Convert Your Gym Into a Multifunctional Space? A soundproofed gymnasium will capture unwanted background noise and convert the energy out of the space. As a result, original sound clarity can be restored as competing background sound subsides. Proper soundproofing ensures a more functional and user-friendly space, so you can host a variety of events — from music performances to guest speakers to gym classes. How Do Sound Panels Control the Echoes in a Gym? By placing sound panels on your walls or ceiling, you can effectively capture the echoes in the room. The result is lower levels of background noise, greater sound clarity, lower levels of crowd noise, and a more functional and user-friendly space. Gym sound panels can capture and convert up to 80% of unwelcome echoes in the room, delivering premium sound quality to your soundproof gym space. Do Ceiling Baffles or Wall Panels Work Better to Soundproof a Gym? The key to successful gym soundproofing lies less in panel placement and more in your total coverage. As long as you place the right amount of sound panels in your space, you’ll be able to pick up enough first wave echoes and convert them out of the room. Wall-mounted sound panels are called Fabric Panels. 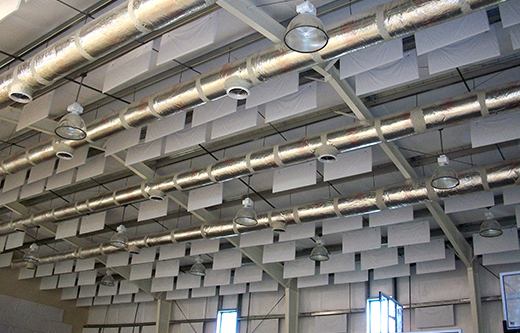 Ceiling-mounted sound panels are called VET Baffles. In either case, the goal is to collectively capture and eliminate your echoes so that your background noise will collapse. Because the VET Baffles are less expensive than the Fabric Panels, the ceiling treatment is a far more popular gym noise reduction option. How Many Sound Panels Does Your Gym Need and Where Should You Place Them? 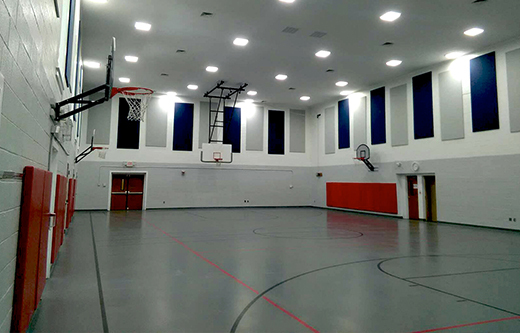 Sound panel coverage amounts for a gym soundproofing project are totally dependent on the size of the gym space. To help calculate your coverage amounts, use our Room Analysis tool to submit your room dimensions. The goal is to equally spread your sound panels out across the expanse of your ceiling or perimeter wall surface, depending on which acoustic panel treatment you select. For questions related to the installation of your sound panels, contact our help desk at 1-800-638-9355. What Are the Benefits of Using NetWell’s Sound Panels in Your Gym? Once a gym reaches premium sound quality, the space becomes more user-friendly and functionality improves. The obvious advantages include lower crowd noise which makes your space more compatible for coaching or teaching. In addition, a soundproof gym space can also double as a multi-purpose venue for hosting a variety of social events, ceremonies, guest speakers, musical performances and more. Gym sound panels will elevate the overall usefulness of your room. As with most gym projects, schools, churches and YMCAs are all on tight budgets. Maneuvering through the financial end of our sound panel projects is the biggest hurdle to overcome on your sound proof gym. If you are serious about controlling your gym noise, and want some good background information on how to push through your gym soundproofing project on a tight budget, sign up for our StartSmart series. This is a free tool designed to help our clients control both their noise and their pocketbook. Sign up today! 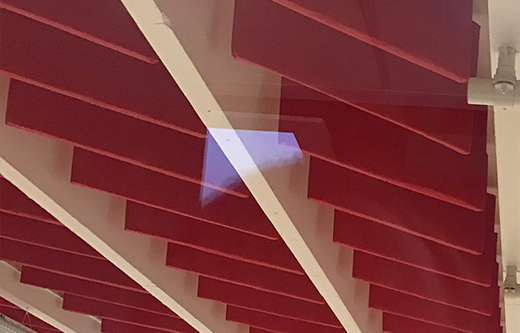 To help target the appropriate amount of sound panel for your project, we offer a free innovative tool to help define the framework for your treatment and quote your project. Questions? Call 1-800-638-9355. Use this form to submit the dimensions of your gym. From there we will calculate your coverage amounts and quote your project back. The key is to avoid the mistake of under treating your space. Questions? Call to 1-800-638-9355.